This summer at Beyond Walls, I wrote a piece on the 23rd Psalm and Kelly. The Christian Century has published it on their blog. Kelly Gissendaner is scheduled for execution in four days. Please pray for her. Please also pray for her family, for the family of Doug Gissendaner and all who commit and are victims of violent crimes. And pray for the State of Georgia, who sees execution as an acceptable form of punishment. May we find our hearts moved to do justice and to love mercy and to walk humbly with our God. A week ago I left our parish retreat and drove to my hometown, expecting to visit with my father for a bit and drive home. But one look at him and I knew. The vigil was beginning of what would be the last days of his life. He died, surrounded by love. I miss him. And I suspect I shall always be searching for him, in the benediction of the rain, the bite of a good scotch, in the hummingbirds at the feeder, and in the telling of good stories. Yesterday, the first morning in over a week, I woke up in my own bed, and began the day drinking coffee brewed in the familiarity of my own kitchen and watching the world wake up from the beauty of the back porch. And then we went for a walk. Our neighborhood walks often include stops inside of houses being built or rebuilt. Mandy likes to look at the layouts and changing construction. She’ll often point out what she likes or critique what she thinks might be a better flow or plan for the house. I like to imagine what it will become, to see the bare beam and subfloor and know that once our house was only this, waiting to become something more complete, and then to come back and see what the final product yields. Today we walked past one of our favorite renovations, now complete, with a “for sale” sign in the yard. We haven’t walked through it yet, but we will. 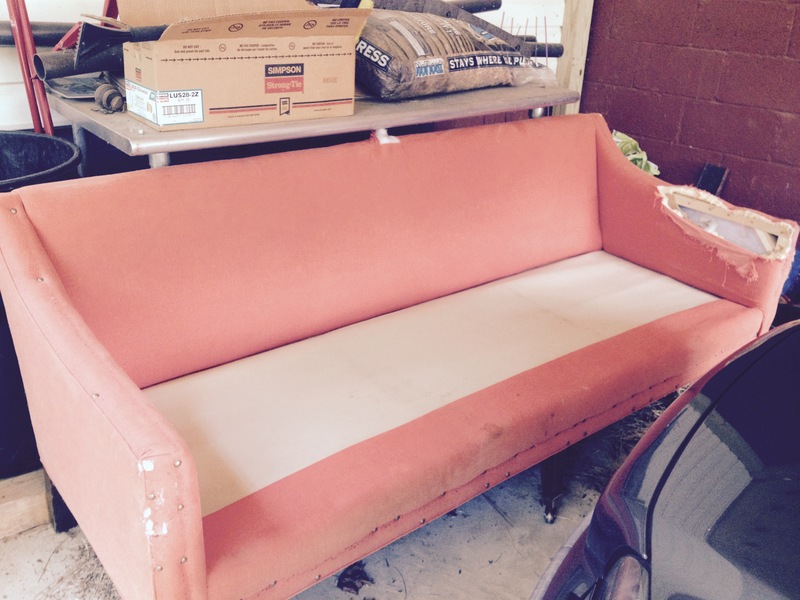 Outside was a giant dumpster, complete with a beat up orange couch. Mandy and I rarely agree on anything related to style. She likes classic, I like more modern. She likes neutrals, I like loud colours. You get the idea. But this upside down, in the dumpster sofa–something about it spoke to both of us. We called our neighbor with the pick up truck and he drove with us to pick it up. He took one look at the sofa and said “I’m chalking this one up to grief!” Somehow I think I’ll need a project in the next few weeks and months. While I won’t physically reupholster the couch, I’ll help imagine and create what it will become. I love the idea of something discarded finding meaning, of that which we thought was finished becoming something new and delightful. One of the many things my father gave me was this truth: there are always hidden gifts and joys waiting to be discovered. Someday I will tell you more about my father. I will post my favorite picture of him, in his headset, in the control booth he so loved, telling someone what to do to get the perfect shot. He holds a cigarette, which even now, I don’t hate. It was part of who he was, it was part of the choices he made that made up a life and ultimately a death, which was, thanks be to God, holy and good. It is him, captured for a moment in time, but the essence, remains. Songs have been a big part of this journey–hymns and folk tunes, the songs he sang in our growing up, the jazz he loved. We have been singing. This is the one that came to me as we were out walking this morning. It’s a simple tune from Iona, one of my favorites (alas, the internet doesn’t seem to have a lot of good audio or video from Iona, but I’ll sing it for you if you ask). We sang it as we walked part of the way. I trust that it is as true for me as it is for him. Beginning with you and starting from today. My promise is true, for I am Christ the way. © WGRG, Iona Community, 1995. I woke up to this text today: “Good morning, friend. Sun comes up, it’s Wednesday morning…”. Small gifts come, like these. It feels like we’ve been here for months and then I realize it’s not even been three full days. People come and visit, each visit a gift too, a reminder of how much love there is. Food comes, so much food. My favorite offering so far came from a family friend who brought a bottle of wine, a bottle of hand soap and a giant package of toilet paper. Practical and hilarious. Yesterday the church choir came and sang to him us for almost an hour. They started with Morning has Broken. And I sang the first verse with them. As the second verse started, ever so gently the choir master whispered “parts” and this lullaby morning song opened into something wholly other, the familiar song, the glory of a magnificent choir in four part harmony, the surround of home and nature, the comfort of church, this strange thing that I’ve known all my life, holding us in this liminal moment. Tears took my voice, as they will, and that too was a gift. My last conversation with my father was a week ago today. It included many things, some of which are uniquely mine and I hold them in my heart. But a memory I cherish, was watching him eat. We’ve been given the gift of remarkable sitters to be with him during the day and the night. Kimmis, a young, strong new father, stays with my papa during the day. And they have formed this lovely relationship (don’t get me started on him crying yesterday when we explained that we weren’t going to feed or give Papa any more water. Such care and love, even in this new relationship. Today he’s bringing his 7 week old son to meet my father.) But last week, Kimmis brought up lunch for Papa. Soup and cantaloupe. And after every bite, my father would stop and say “it’s just so delicious. Thank you. I’m so grateful.” After every single bite. His gratitude, a gift that I’m holding and hoping to reflect back to him this day and in the years to come. This morning his breathing is more labored. We move, day by day, hour by hour, moment by moment, closer to the end of his labor. And it is like labor. No one can do it for him. The last step, the last leap, his alone to make. Mandy sang this for him, I joined and it’s now become the lullaby offering I can give. The internet doesn’t do it justice. A song from Iona, appropriate as the veil is very thin, even now. A few weeks ago I was given an unexpected gift. As a graduate of the school where I received my massage therapy training, I’m eligible for a free series of personal training sessions with their student trainers. Better still, it’s held at this crazy fancy, I-could-never-afford-it-otherwise gym. So I signed myself up. And I’ve been working with this super young, super southern, super kind young man who just LOVES what he’s doing. He gets so excited to explain how the muscle groups work, how this exercise works not only the obvious muscles, but also these less obvious muscles. He often gives me tons of information I don’t fully understand, but I nod my head knowingly and say “wow” and I mean it. When I was last there he gave me a new exercise–a sort of reverse plank–and I got down on the floor and started this pose and said “how long do I hold this?” and he said “as long as you can.” I had to explain to him that I need a goal. “As long as you can” translates to 5 seconds for me. But tell me I’ve got to go for 30 and I can probably do that too. I’m pretty good at psyching myself out, but, as it turns out, I’m also good at surprising myself (I made it 40 seconds, BTW). We were talking during my rest periods and got on the topic of the human body. And this kid, with his soft southern drawl and “yes ma’am” politeness looks at me and says “the human body is just…crazy amazing. I just can’t believe it. It’s so..”and he exhales this huge breath of air, smiling in both delight and admiration. The kid has awe about our human bodies–our imperfect, trying to figure them out, full of shame, full of grace, full of complexity bodies. And that too, of course, was a gift. Because awe can be contagious. I write this from a church retreat in the Northeast Georgia mountains. I spent about a year and a half serving a parish not far from here, a wonderful sojourn that fed my heart and soul. So the air up here is balm for my lungs, the views are familiar to my eyes, and I find myself more at home and more at peace in this complicated old body of mine. Last night we gathered around a bonfire, sang every cliche campfire song you can imagine, made s’mores and prayed some ancient prayers. I loved it all, but mostly I loved watching and talking with these beautiful high school students, who took pictures of each other, laughed and sang, danced and played in their blissfully new, still being discovered bodies. And I’m here, holding onto the constant truth that my father is in the final moments of his earthly pilgrimage. Watching cancer destroy his once strong body has me thinking a lot about these strange things we live in. They can give us such joy and pleasure and delight. And they can cause us to feel shame and powerless. We experience the world through them. We experience God through them. And God, at least in my tradition, experienced the world through something so strong and so frail. When God kissed the ground in Bethlehem, when God put on human skin, when God danced on this earth, I hope God felt the fullness of this strange and holy mystery we call body. We tend to focus on the pain Jesus felt, but I wonder why we don’t tell the story of what it was like for Jesus to feel the cold water of the Jordan River, to taste the sweetness of the figs (before he cursed the tree, of course! ),of Mary Magdalene rubbing his sore calf muscles after that long hike up Mount Tabor, of walking hand-in-hand as a boy with Joseph through the bumpy roads of the Galilee, of the way the bread his mother made tasted or the time his best friend made him laugh so hard he peed himself a little (that happens to men too, right?). We who claim the Christian faith claim not only the divinity of God, but the humanity of God too. God made flesh. God made body. And yet we shy away from the complexity of the human part, the body part. I wonder if we’d have Ashley Madison scandals and televangelists who preach one thing and then are caught in shame-filled scandals if we were a little more comfortable with the complex and holy and deliciously real things that are our bodies. I don’t know. But I do know this: they are amazing, resilient, breakable, fixable, unique, adaptable, full-of-memory, transformable and graceful. They are holy. Wow. Photo from a Trip Advisor review of Veranda Beach Club, Longboat Key. We’re spending the week at Hilton Head, dog sitting for some friends who have a wonderful home that once looked out to the ocean. New houses have since popped up–McIsland McMansions, that mostly serve as rental properties. It is striking how many swimming pools fill the yards, even with the ocean just steps away. The first time we visited, in November of 2014, we were arriving well after dark and I was taken by the lack of light pollution even as we drove the highway of the island. No signs recognizable from the road–no Golden Arches or Green Mermaid Goddesses of Starbucks were visible. Even the small gas station signs, while lit, were darker than the ones that line my street. No blinding lights calling out into the night sky. Driving in, it becomes clear that you are entering a different space, sacred, if you will. The reason is the sea turtles. 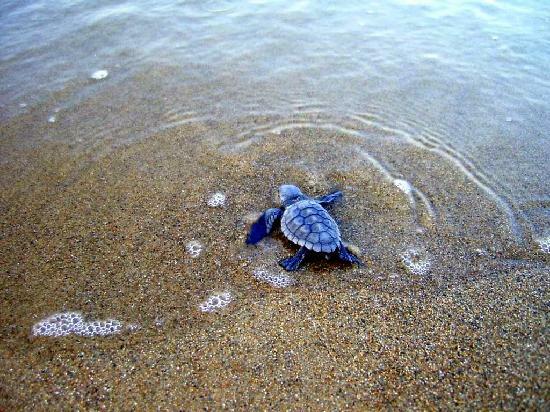 Hilton Head is a nesting place for loggerhead sea turtles. An average of 150 nests are made here each season. And so the lights are dimmed, because artificial lights confuse the turtles. Artificial light is a threat to the safety of the turtles. The turtles will follow the light and lose their way, moving away from their natural habitat and getting lost in our human sprawl. The choice of an island to honor the sea turtle by reducing their lights, I remember thinking, is gracious. In our need to sell, promote and out-brand the other, this gentle lighting and making intentional turtle space feels like a small gift back to creation. This morning we got up early, hoping to watch the sunrise (we were not early enough!). We made our way with the dog and the tennis ball to the beach. There we met up with two St. Bernard puppies (both of whom were twice as large as our fully grown charge) and their humans. We talked dogs and neighborhoods and then we stumbled upon the topic of the sea turtles. A nest hatched last night. And at the same time, a bunch of people renting one of the new houses on the beach threw a party. Not knowing any better, I suppose, the house went to bed, with all the lights on. Through the night, the house lights shone out over the sands. The baby turtles made their way, not to their home in the ocean, but to the rental property, an icon of that over-built, over-indulged space of entitlement we humans seem so gifted at claiming. And the turtles tried to find water. Some found their way to the chlorinated pool and it’s powerful drain. A sole turtle made its way to the garage and found a puddle of water. When the rescuers came, the turtle was trying, with all its might, to swim in the puddle. The turtles remained strong, despite their being turned into the wrong direction. But the chlorine and the lack of water means that rescuers are doubtful that they will survive. I’ve walked the beach these past days with the first lines of Genesis running through my head: In the beginning when God created the heavens and the earth, the earth was a formless void and darkness covered the face of the deep, while a wind from God swept over the face of the waters. I’ve thought about God the separating of the sea and the dry land. I’ve prayed the familiar (to me) prayer “at your command all things came to be: the vast expanse of interstellar space, galaxies, suns, the planets in their courses, and this fragile earth, our island home.” I’ve thought about God creating all the creatures that dwell on the earth–the dolphins and the cardinals, the lizards and the gnats, the puppy-dogs and the humans. And I’ve wondered about that other planet they’ve recently found, one someone bigger, and a bit older than ours, but otherwise remarkably similar. I wonder if there is trash in their oceans, and hungry children on one side and overfed children on the other. Today I wonder if there is safe space on that planet for sea turtles to nest. I try to be a good steward of creation. My choice to return to a vegetarian diet is part of that. I recycle. I try to buy more of my clothes at the thrift store than new. But I fail. I use too much water. I waste food. I am thoughtless with my driving habits and gas consumption. I am part of the problem that faces the sea turtles. I am part of the destruction of Creation. But all is not lost. We find our way back, one step at a time. I don’t know all the steps, but I suspect it begins with listening to the songs of creation, the birds that sing, the waves that lap, the dogs that bark, the humans that cry. And finding our place in the song. We gathered in the nave, the worship space of the church. Our task was to create a skit, highlighting a favorite moment of our recent multi-parish youth mission trip. The usual hilarity ensued. Giggles and stories. Groupings–pairs and triplets–formed, subgroups hard at work on the task. Except for one young man, whom I knew, but not well. He walked behind the altar, at first to take a closer look at a statue of Jesus. And then, standing at the priest’s place at the table, with only a little bit of trepidation, he began to chant the Eucharistic prayer. Or at least pieces of it were somewhat recognizable as an attempt at the Eucharistic prayer. People stopped, laughed (not unkindly), helped him out a little (the chorus of “and also with you” was significant) and together they tried to remember what exactly those words were. A mix of prayers from Compline and random proper prefaces got thrown together as he stood in Orans position. I watched for awhile. While the others worked on their skit preparations, he continued, talking/praying/chanting ,half laughing, half praying behind the altar. I watched for a minute longer and then went into the sacristy and pulled out the altar book, the book that has both the words and the musical settings for our prayers. Taking it and laying it on the altar, I stood just behind him, and then set myself in a matching Orans posture. “Like this” I said and then I began the song that is as familiar as my own skin. He followed, singing with me, not nervous until he suddenly remembered that I am actually a priest and this was my church. Confusion flooded his face for a moment, for surely he was breaking the rules standing here, reciting the priest’s words, standing in the priest’s place, and yet, the priest was standing with him. 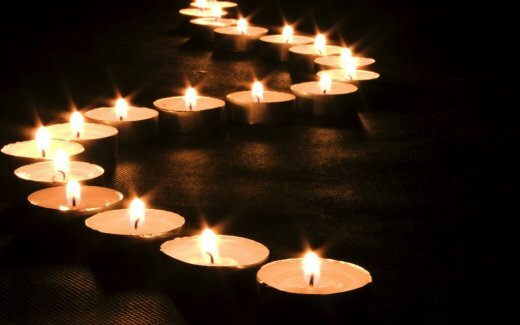 Some of my own earliest memories are just that–kneeling in the pew, watching the priest (his back was turned to us in those days), praying, barely above a whisper, those holy words etched so deeply on my heart “therefore with angels and archangels and with all the company of heaven” along with the priest. It’s funny how words become so much a part of us. We pass them on, holy words, holy prayers, one generation to the next. Tonight I gathered in the school room of the prison. Together about 35 of us made a lopsided circle. We prayed the ancient prayers, sang holy songs. As I lifted the cup of grape juice and said the familiar words of blessing, I heard C, our sacristan who also happens to be an inmate, whisper the prayer with me: “do this for the remembrance of me.” The beauty of it caught my breath for just a moment. And then I carried on. I wonder what it is that makes something holy. Would any of it *be* holy without all the other? Without the prayers, it’s just a cup of juice and a cardboard cracker. Without the breath, priest and people, silent and aloud, it’s just words. But mix it all together and it becomes something wholly new–an invitation, a trust, a hope that God is moving and abiding and birthing new life into us even (or perhaps especially) in our everyday and ordinary. Holiness, I am more and more convinced, sneaks in when we least expect it, mingled into our life like cream into coffee. Not to be stored away, locked in the tabernacle or kept in secret, but waiting to be poured out, like precious oil upon the beard, upon us all. tow’r and temple, fall to dust. Two blocks up the road from my house is a large, five street intersection. One corner boasts being the original site of the Dekalb Farmer’s Market. Another was home to my favorite thrift store. The center of the intersection was the Baptist Church. As an undergraduate at Agnes Scott College, this was one of the landmarks that marked the arrival to my college town, the return to school, the promise of growing up. Maps and I have never gotten along so well, but landmarks I can manage. Turn left at the Baptist Church and then go two blocks more, towards the old car dealership…those are words I can understand. I’ve known they were going to tear it down. We’ve been at war with Wal-Mart for years. And when we finally lost, and as the congregation of the Baptist Church continued her decline, the future quickly became apparent. The once quirky intersection where the bowling ally, the local pub and the fabric store all took up residence would become just another corner with a Wal-Mart and a generic strip mall. And yet. It took them weeks, maybe even months, to prepare the church site for demolition. Like they were preparing a body for burial. They took it down in such small bite size pieces, almost with care–a gathering room here, a kitchen there. Still the front stood proudly, the sanctuary and her steeple. In the final days, everything was gone, save those very front walls. The very last days, in the broken out windows, amid the rubble, someone appeared. Dressed head-to-toe in black, the body could be seen dancing or protesting, no one is really sure. It’s the stuff of neighborhood debate. I heard it was a ninja (really! that was a rumor!). Another heard an artist. Another still a film student making a film. Whoever it was, someone noticed the transformation, the final stages before her complete demise. On the last day, all that was left was a single rectangular structure–walls with a steeple. 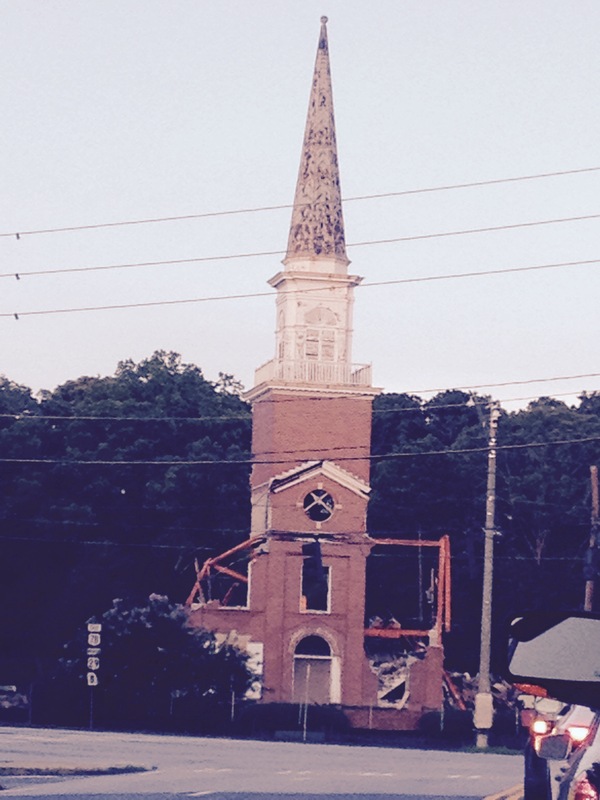 As they started to work, tearing down the steeple, she would not go without a fight. It took bending and contorting the piece before it would give way, anchored so well to the old brick, the steeple itself seemed to lift its dying breath in protest. And then it was gone. The rest came down quickly. Nothing left to stand for, once the steeple gave way. The rubble was cleaned up in less than a day, a stark contrast to all time it had taken to get there. And now, for a pause that I imagine won’t last long, it sits barren, an empty lot. The first few times I drove by it, I literally got lost. Not for long, but I lost my bearings. Turn right at the church, then you’re almost home. That’s the familiar way of travel. And suddenly that compass point was gone and I found myself having to shift, to adjust my own markers and map. But now the emptiness has become its own marker. My eyes have shifted to meet the space and recognize it for what it is. And in time I will again adjust, to recognize the ugly strip mall that will go in it’s place as the new landscape of home. Less than a year ago, on my last day of work at my church in the foothills of the Northeast Georgia Mountains, I packed up my office and turned in my keys. The rain had stopped and I looked up. As if a gift from the Creator, there was a rainbow pouring over the steeple. The doors always open, I walked into the church, one last time, to say goodbye. I sat in the old rickety wooden pews and looked out over the pines as the day turned to night. I sat in the dark–I don’t know how long–and sobbed. Here, in these walls, had been my home. Not for forever, but for a time. They echoed with Eucharists and healing prayers, with funerals and baptisms, with laughter and with intimate confessions and the promise of absolution. Choirs had sung and the organ had played, often off key and with missed notes and still God was praised. Here I had stood and told the congregation that someone they loved had died or that someone they didn’t yet know, but already loved, had been born. Here I stood and blessed, broke and shared God with people. All of it, etched in the bones of that place just as it is etched into me. I don’t grieve the Baptist Church–not really. It wasn’t mine, save a familiarity, a comfort driving home. But I grieve for those who lost it. They will find and make new walls, for, as we all know, the Church is not the building, the Church is her people. And yet. They are the places that shelter us, that teach us, that frustrate us, that encourage us. They are the walls that stand when we sometimes can not. Until they can no more. Loki lives, for now, in a prison cell with his friend B. Where B goes, Loki goes. And so when B comes to the weekly Episcopal Eucharist, Loki comes too. He takes up residence, stretching his long body out behind an old metal desk that we’ve pushed to the side to make space for our circle. With patience he waits as we read, and sing, preach and share holy bread and grape juice. Loki makes no requests for treats or holy blessings, but I can’t help it, I offer him one anyway. Despite my brand specific preference for Black Labs, Loki gives me pause. The service ends and I make my way to Loki. There is an innate kindness and sadness in his eyes that makes me it even harder to leave these prison walls. B and I talk about life and her week. We talk about Loki too. He is the calmest of her charges. B tells me I can take him home if I want. “He deserves good people.” I am honored that I pass her litmus test as one qualified to share a life with such a beloved friend. The sun begins her descent and it is time for the three of us part. I am struck, and not for the first time, at the space between us. While I may enter, I do not stay. B and Loki live beyond the walls where I am welcome, beyond the walls of safety and freedom. They live in a world of chains and buzzers and slamming doors. I want to cross the chasm. But I can not. Yet Loki does. With that mystical power that comes from being something other than human, Loki makes a home amid the shackles and chains, the bars and wires that, if we’re honest, terrify us. Loki has no such fear. He sees past B’s crime, into the kindness that her hands and heart offer him. Loki sees the goodness in me too. He bumps up against me. “I don’t have any treats, I’m sorry buddy” I tell him. “That’s okay,” says B. “He doesn’t want treats. He wants you to pay attention, to love him. It’s all he cares about.” I scratch his head one last time before the guard escorts me through the gates. 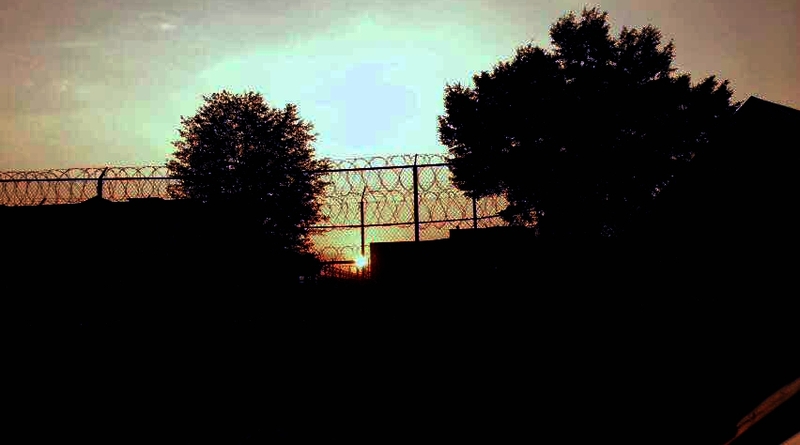 Outside I watch the sunset, struck by the beauty of the rays that bounce off and illuminate the wire and gate. There is hope, even in those places that look like the end. There are no limits for where Love will go. I turn the key in my engine, take a final look back, and begin the long drive home. This week I am spending a week in Gambier Ohio (population 600 people and 29 bicycles) at Beyond Walls: Spiritual Writing at Kenyon College, also affectionately known by its participants as Writing Camp. I’m sleeping in a top bunk bed, although, to be fair, it has no bottom. The bottom bunks are all in another dorm. We eat delicious food that has been prepared for us and are in groups that go do different counselors teachers each day who impart knowledge and inspire discussion and give delicious writing prompts. I am exhausted and exhilarated. It’s exactly where I need to be. I’m sure at some point there will be s’mores. 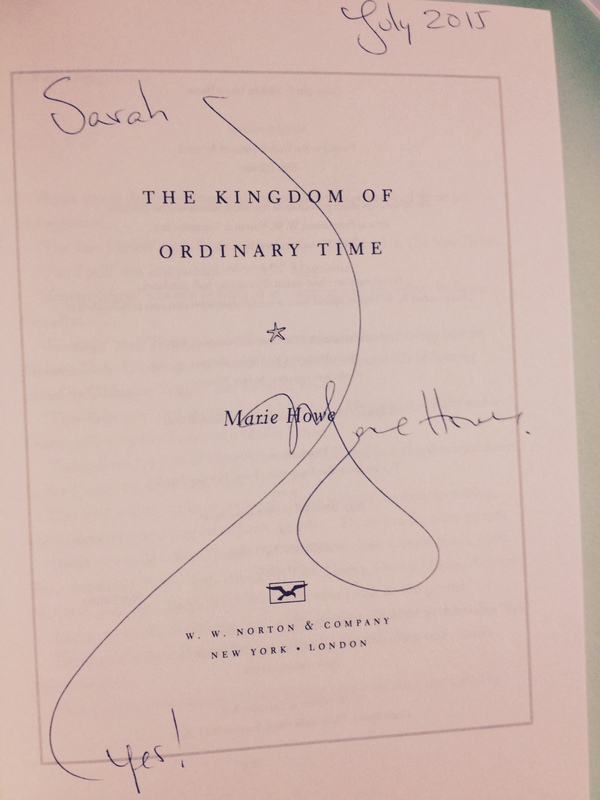 One of the highlights for me has been hearing Marie Howe read from her poetry. I had read her work before, but to hear it in her own voice, I laughed in places I couldn’t have imagined and found my eyes full of tears more than once. Her daughter called in the middle of her reading–and she answered it. It was one of my favorite moments, because she was so real. Today I went to her book signing. Instantly, I am reduced to an awkward 13 year old stumbling for the right thing to say. Marie made it okay. She signed my book! He would always find me. I don’t know where to find it.